Texas Heritage Beef offers gourmet-quality, dry-aged beef. Healthier grass-fed and gluten-free sorghum-grain-finished beef produces meat that is juicy, tender, and full of flavor and essential nutrients. Beef is lower in cholesterol than buffalo, chicken, turkey, pork and lamb, making it a healthier meat choice. ▬ Texas Heritage Beef Company maintains ownership and strict oversight of the entire life and processing of its cattle. ▬ Meat is processed at a USDA-inspected facility. ▬ Cattle are offered all-vegetarian, pesticide-free feed — NO corn, animal by-products, or other additives. ▬ No additives to the finished product, such as water, dyes, tenderizers, or preservatives. ▬ Cryovaced and frozen for your safety and convenience. 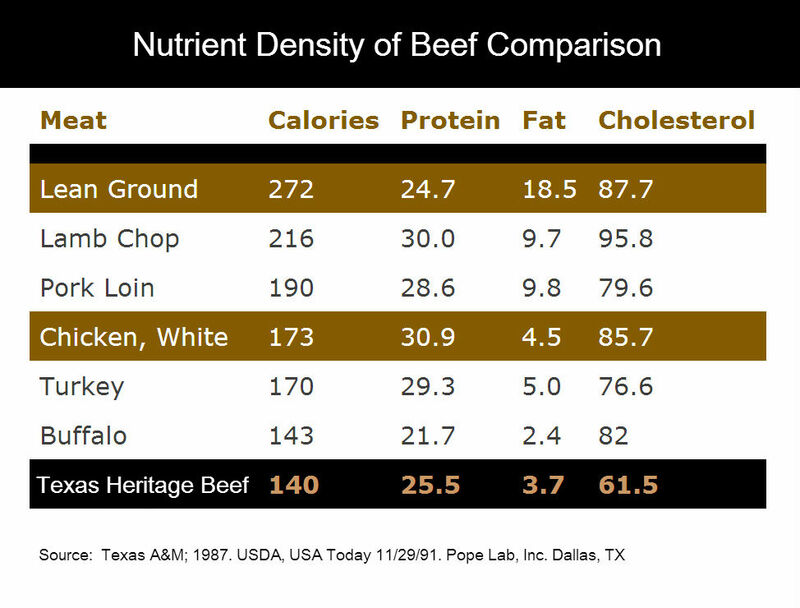 How is Texas Heritage Beef Different from the Local Grocery Store? is wet aged for up to 28 days. Wet aging consists of allowing cryovaced beef to break down for tenderization by remaining in its own juices. This process will tenderize to a point but will not enhance the flavor of the beef. can be electro-shocked for tenderizing at the processors. For a truly great, premium steak, beef should be dry-aged, a process rarely used in today’s commercialized beef industry where wet aging is the norm. We process our animals in a small USDA-inspected facility, where experienced butchers dry-age our beef for peak tenderness and concentrated flavor, then it is carefully trimmed and cut. The premium steak product is then shrink-wrapped (Cryovaced) and frozen to seal in the freshness and flavor. 30 years ago, dry aging was a standard for aging beef. In a mass-produced commercial environment where all the attention is to the profit margin, dry aging has been done only for a few discriminating customers. Currently, 90% of the beef sold is either wet-aged or not aged at all. There is a reason your favorite steak house insists on dry-aged beef!! Dry-aged beef typically costs 25% more than wet-aged beef. But if you have ever had dry-aged beef, you know the cost is worth it. Dry aging has almost become a lost art, along with the neighborhood butcher.